Professor José Moura; his wife and fellow CMU faculty member Professor Manuela Veloso; signal-processing researcher and Adjunct Professor Aleksandar Kavčić; and his wife, Dr. Sofija Kavčić, have jointly donated $16.5 million to the university to support education and research activities in data science and engineering. 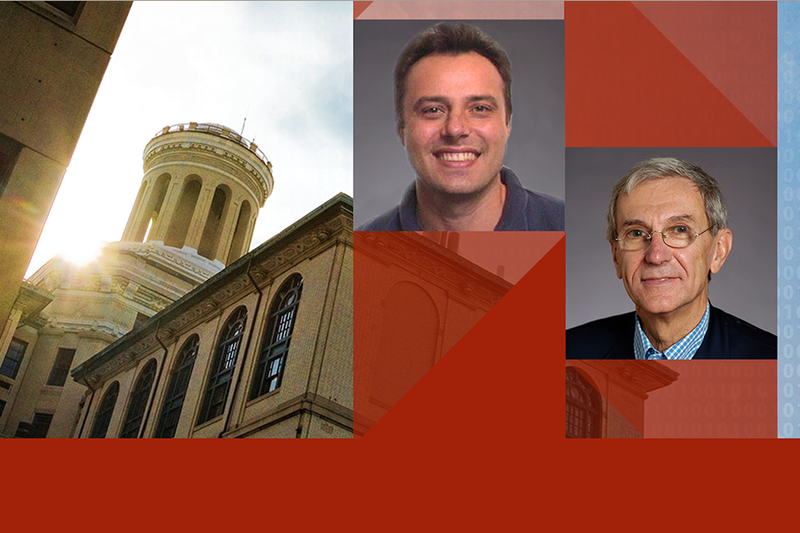 Moura is the Philip L. and Marsha Dowd University Professor in CMU's Department of Electrical and Computer Engineering; Veloso is the Herbert A. Simon University Professor in Computer Science and Robotics and head of CMU’s Machine Learning Department; Alek Kavčić is a former doctoral student who recently accepted an adjunct appointment at CMU in the Department of Electrical and Computer Engineering; and Sofija Kavčić recently worked at Architects Hawaii, an architectural firm in Honolulu. Moura and Alek Kavčić, then a Ph.D. student at CMU under Moura, invented and patented a detector that could safely extract recorded data from disk drives that were becoming ever smaller in physical size. When, in the early 2000s, recording technology led to a tremendous increase in magnetic recording density, their detector algorithm invention became a must-have technology to detect accurately the information from very weak signals corrupted by very strong new types of noise. It is estimated that the disk drives in 60 percent of computers (over three billion) made in the last 14 years contain this detector technology, which enables users to recover correctly saved data. The fund will support research and education activities in data science and engineering and aims to join technologists and quantitative scientists from the College of Engineering, School of Computer Science and Department of Statistics with domain specialists across the university. The Kavčić–Moura Endowment Fund will offer Presidential Fellowships and Scholarships to doctoral, graduate and undergraduate students, provide grants to support course development and research in data science and engineering across the university, and include chaired professorships in the Department of Electrical and Computer Engineering. It will further support educational, academic and research work at the university’s Data Storage Systems Center (DSSC), which is a collaborative effort between several departments. Moura's research has focused on the theory and applications of signal and image algorithms. Besides detection in high-density recording, he has worked on radar and sonar, wireless communication, medical imaging, and more recently on understanding how large scale behaviors emerge from local interactions, for example, blackouts in critical infrastructures, epidemic outbreaks in populations, or congestion in cities. His research group has developed technology like Spiral (computers programing computers) that has been licensed by several companies. "We live in a society awash with data,” Moura said. “With its exceptionally talented faculty and students, CMU has an opportunity to lead the nation in finding the new solutions to acquire, store, access, transmit and intelligently process these data, so we can have better health care, better education, better business solutions, better engineering and more fulfilling jobs. “With this gift, Manuela and I want to contribute to strengthening and expanding CMU's research and scholarship in the emerging field of data science and engineering," he said. James H. Garrett Jr., dean of the College of Engineering, said the college is very proud of professors José Moura and Alek Kavčić and the major impact of their work. “I am truly grateful to José, Manuela, Alek and Sofija for their impressively generous gift to further the college's and CMU's efforts in data science and engineering,” Garrett said. “The Department of Electrical and Computer Engineering is proud of professors José Moura and Alek Kavčić's revolutionary work in signal processing,” said Jelena Kovačević, the Hamerschlag University Professor and head of the Department of Electrical and Computer Engineering. “We thank them for their gift to the university and college; this gift will ensure support for students and research in the field for years to come." Moura joined CMU in 1986 as a professor of electrical and computer engineering. He holds a courtesy appointment as professor with the Department of Biomedical Engineering. Prior to joining CMU, he was on the faculty at Instituto Superior Técnico (IST), the Engineering School of the Technical University of Lisbon in Portugal. He has had visiting faculty appointments at MIT and NYU, and he was a visiting research scholar at the University of Southern California. Moura received his doctoral degree in electrical engineering and computer science from MIT, where he also received his master’s degree in electrical engineering. He holds a Licenciatura em Engenharia Electrotécnica from IST. Prior to joining the University of Hawaii in 2007, Alek Kavčić was an assistant professor of electrical engineering in the Division of Engineering and Applied Sciences at Harvard University, where he also served as the John L. Loeb Associate Professor of Natural Sciences. While on leave from Harvard, he served as a visiting associate professor at the City University of Hong Kong, and as a visiting scholar at the Chinese University of Hong Kong. Kavčić received a degree in electrical engineering from Ruhr-University in Bochum, Germany, and a doctoral degree in electrical and computer engineering from Carnegie Mellon University. Veloso, who is renowned for her work in artificial intelligence and robotics, conducts research with her students on a variety of autonomous robots, including pioneering work on robot soccer. Using her CoBot service robots, she has developed the concept of symbiotic autonomy, in which intelligent mobile robots are autonomous, but also aware of their physical, cognitive and perceptual limitations and able to ask for help when necessary.